Previous studies on the role of TP53 mutation in breast cancer treatment response and survival are contradictory and inconclusive, limited by the use of different endpoints to determine clinical significance and by small sample sizes that prohibit stratification by treatment. We utilized large datasets to examine overall survival according to TP53 mutation status in patients across multiple clinical features and treatments. Confirming other studies, we found that in all patients and in hormone therapy-treated patients, TP53 wild-type status conferred superior 5-year overall survival, but survival curves crossed at 10 or more years. In contrast, further stratification within the large dataset revealed that in patients receiving chemotherapy and no hormone therapy, wild-type TP53 status conferred remarkably poor overall survival. This previously unrecognized inferior survival is consistent with p53 inducing arrest/senescence instead of apoptosis. Addition of hormone therapy to chemotherapy improved survival notably in patients with TP53 wild-type tumors, but not mutant, suggesting hormone therapy could eradicate arrested/senescent cells. Testing this, we found that estrogen receptor-positive, TP53 wild-type breast cancer cells that were made senescent by doxorubicin treatment were sensitive to tamoxifen. The poor survival of chemotherapy-treated patients with TP53 wild-type tumors may be improved by strategies to eliminate senescent cells, including the addition of hormone therapy when appropriate. TP53 is the most frequently mutated gene in cancer, including breast cancer . TP53 codes for a transcription factor, p53, that initiates transcription of genes involved in cell cycle arrest, cellular senescence, apoptosis, metabolism, DNA repair and other processes following cellular stress . p53 activity is modulated by numerous posttranslational modifications, association with protein partners and regulators, and access to chromatin . When p53 is activated in response to chemotherapy, the constellation of targets transactivated and the degree of induction varies by tumor and cell type, thus altering the fate of the cell . Perhaps owing to the complex molecular activities of p53, there are conflicting reports on its role in breast cancer. TP53 is mutated in approximately 30% of breast cancers , but the clinical relevance of mutant status in a tumor is muddled by different studies that show TP53 mutation can be detrimental, neutral, or beneficial to outcome (for examples/review, see [3–6]). Comparing these studies to determine why they have reached different conclusions reveals that different methods and surrogates have been used to determine the status of TP53 in the tumor, and then presence of mutation has been correlated with different clinical endpoints to determine prognostic significance. These include disease-free and overall survival that suggest mutant TP53 status is detrimental [3, 5], and extent of residual disease present at surgery following neoadjuvant therapy that suggest mutant TP53 status is beneficial [4, 6]. Problematically, no study has had a sample size sufficient to stratify according to pathological characteristic and/or treatment regimen, potentially obscuring actual differences in survival among populations. Here, we utilize a large dataset with long-term follow-up to define the role of TP53 mutation in distinct populations of breast cancer patients. METABRIC data were accessed through cBioPortal  and Kaplan-Meier survival curves with a 20-year endpoint were created (GraphPad Prism, Version 6.07; GraphPad Software, La Jolla, CA, USA) for patients classified as having wild-type (WT) or mutant TP53. Statistical significance of overall survival curves was determined using both the Wilcoxon test and log-rank (Mantel-Cox) tests. Multivariate Cox proportional hazards regression models were applied to compute the hazard ratios (HRs) and 95% confidence intervals (CIs) for either TP53 mutation status or hormone therapy, with control for confounding variables that include tumor histological grade, tumor stage, tumor size, Nottingham Prognostic Index (NPI) , estrogen receptor (ER) status, human epidermal growth factor receptor 2 (HER2) status, and progesterone receptor (PR) status, using SAS statistical package (version 9.4; SAS Institute, Inc., Cary, NC, USA). All p values were two-tailed. A p value < 0.05 was considered statistically significant. Those patients classified as having chemotherapy were treated as follows: DNA damage/metabolism-based chemotherapy, 297 patients [regimens included combinations of cyclophosphamide (C), 5-fluoruracil (F), methotrexate (M), epirubicin (E), adriamycin/anthracycline (A), and capecitabine (cape); CMF: 123, CEF: 1, FAC: 19, ECMF: 70, AC: 69, ACMF: 4, cape: 11]; taxane-based, 6. One hundred four patients were generically noted as “other” or “chemotherapy”. Nothing (e.g., geographic location, year treated, etc.) suggests treatment for these patients was dissimilar to that of the other patients in the study. Thus, the vast majority of patients received DNA-damaging chemotherapy, and very few were treated with taxanes. All cell lines were purchased from ATCC (Manassas, VA, USA), and were cultured and MTT assay performed as previously described [9, 10] or according to manufacturer’s instructions. Doxorubicin (Sigma-Aldrich, St. Louis, MO, USA), tamoxifen (Apexbio, Houston, TX, USA), Q-VD-Oph (Apexbio) were used at indicated concentrations. CRISPR-mediated generation of TP53 knockout MCF7 cells. TP53 (5′- CATGTAGTTGTAGTGGATGG-3′) and non-targeting (Rosa26) (5’-CGCCCATCTTCTAGAAAGAC-3′) sense and antisense oligonucleotides with BsmbI-corresponding overhangs (Thermo Fisher Scientific, Waltham, MA, USA) were phosphorylated, heated, then annealed to create double-stranded DNA for inserts that were cloned into BsmbI-cut sites in pLentiCRISPRV2-mcherry (Addgene, Cambridge, MA, USA; #99154). Constructs were confirmed by Sanger sequencing. 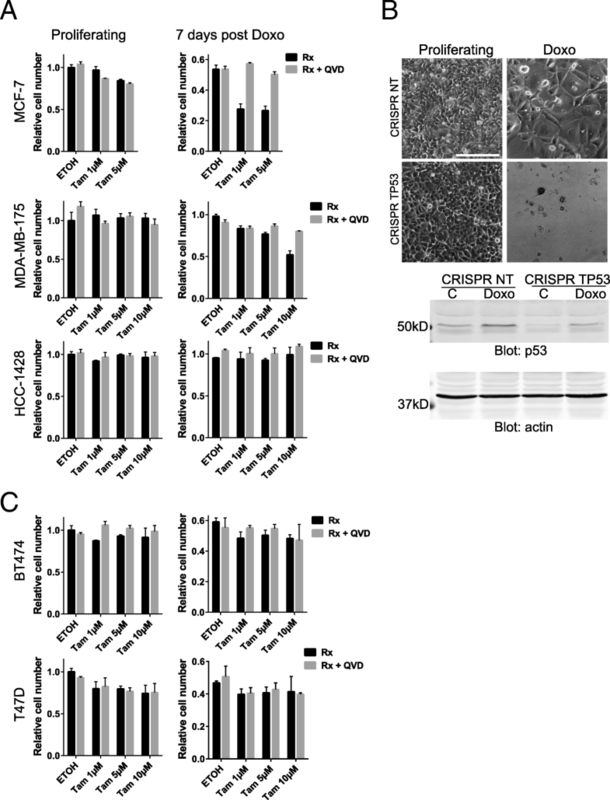 Lentiviral supernatants from 293 T cells  co-transfected with the pLentiCRISPRV2-mCherry vectors, psPAX2 (Addgene# 12260) and pCMV-VSV-G (Addgene# 8454) were used to infect MCF-7 cells by spinfection at 2000 RPM for 20 min. mCherry-positive cells were sorted by Cellular Immunology and Immune Metabolism Core at the Louisiana Cancer Research Consortium, New Orleans, LA, USA. Editing in pools of sorted cells was quantified at approximately 80% by TOPO cloning and Sanger sequencing. Western blotting was performed as previously shown  for p53 (D01, Cell Signaling, Danvers, MA, USA) and actin (BA3R, Thermo Fisher Scientific). Phase contrast microscope images were captured on an Olympus (Tokyo, Japan) IX71 inverted fluorescence microscope using ×10 objective, and then minimally processed by histogram stretching. To overcome the limitations of previous, conflicting studies on the role of TP53 in breast cancer survival, we analyzed the large METABRIC dataset  for overall survival based on TP53 mutation. Confirming previous studies [3, 5], we found that in all 1979 patients, those with TP53 mutant tumors (summarized in Fig. 1a) clearly showed a decreased probability of 5-year survival compared to TP53 WT in a univariate analysis (Fig. 1b) and a multivariate analysis adjusting for covariates that include tumor histological grade, tumor stage, tumor size, Nottingham Prognostic Index (NPI) , ER status, HER2 status, and PR status (Additional file 1: Table S1A). However, a trend was evident toward approximately 200 months where the curves appear to cross. This late trend occurred even though TP53WT tumors had significantly more favorable grade, stage, size and NPI (Fig. 1b). When patients were stratified by PAM50 subtype, only luminal B and normal-like showed the survival advantage for TP53 mutant status (Additional file 2: Figure S1A–F). TP53 encodes a transcription factor activated by cellular stresses such as DNA damage caused by many commonly used chemotherapy drugs . p53 then initiates transcription of genes involved in cell cycle arrest, cellular senescence, apoptosis, and other processes [2, 11]. TP53 mutations typically occur in the DNA-binding domain (Fig. 1a), rendering the protein transcriptionally dead, and unable to respond to cellular stress. Because of its prominent role in mediating response to stresses caused by chemotherapy, we next examined the effects of TP53 mutation on overall survival in various cohorts of treated patients. 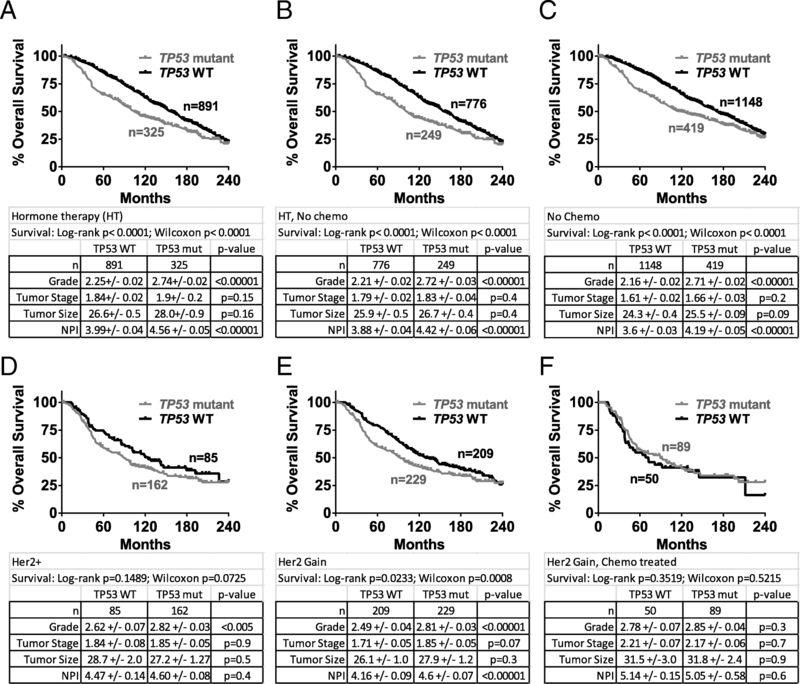 Survival curves for patients with TP53WT and mutant tumors were nearly superimposable for all patients receiving chemotherapy (Fig. 1c), or chemotherapy plus radiation (Fig. 1d). The 60-month advantage in overall survival observed in Fig. 1b for patients with TP53WT tumors was no longer evident. Prognostic factors of patients with TP53 mutant tumors were less favorable or not different than those with TP53WT tumors (Fig. 1c, d). Further examining subsets of chemotherapy-treated patients revealed a remarkable survival advantage in those with TP53 mutant tumors who did not receive hormone therapy (HT) following chemotherapy and radiation in univariate (Fig. 1e, median overall survival 45 months for TP53WT vs 195 months for TP53 mutant) and multivariate analysis (Additional file 1: Table S1D). Previous studies  likely missed this survival benefit due to combining patients who did and did not receive HT (as in Fig. 1c-d). TP53 mutant tumors were only slightly later stage and higher NPI and no different in tumor grade or size (Fig. 1e). In the cases where HT was added as treatment, the TP53WT patients showed a slight survival advantage only in univariate analysis (Fig. 1f, Additional file 1: Table S1E). Unsurprisingly, similar results were found when overall survival was determined based on ER status (Additional file 3: Figure S2A, B), as most patients with ER+ tumors receive HT; and similar trends were observed for all patients receiving chemotherapy, regardless of radiation treatment (Additional file 3: Figure S2C, D). The entirety of this effect of TP53WT changing from unfavorable predictive factor to favorable was due to extension of median lifespan from 45 months to 205 months brought about by addition of HT (Fig. 1g). ER positivity and/or the addition of HT to chemotherapy when patients had TP53 mutant tumors resulted in no survival benefit (Fig. 1h). Comparing mostly ER+ tumors (those who receive HT) to ER- tumors raises the possibility that ER+ tumors were inherently less aggressive and responded better to chemotherapy plus radiation than ER- tumors, and addition of HT had less of an effect than appears in Fig. 1g. Arguing against this, when TP53 status was mutant, overall survival was the same for patients with ER- tumors compared to patients with HT-treated, ER+ tumors when both groups were also treated with chemotherapy plus radiation (Fig. 1h). Further, when only grade 3 tumors were evaluated, a similar benefit to HT was observed (Additional file 3: Figure S2E). Lastly, convincing data from early trials show a clear, significant survival benefit in patients with ER+ tumors treated with chemotherapy plus HT when compared to patients with ER+ tumors treated with chemotherapy alone [13, 14]. 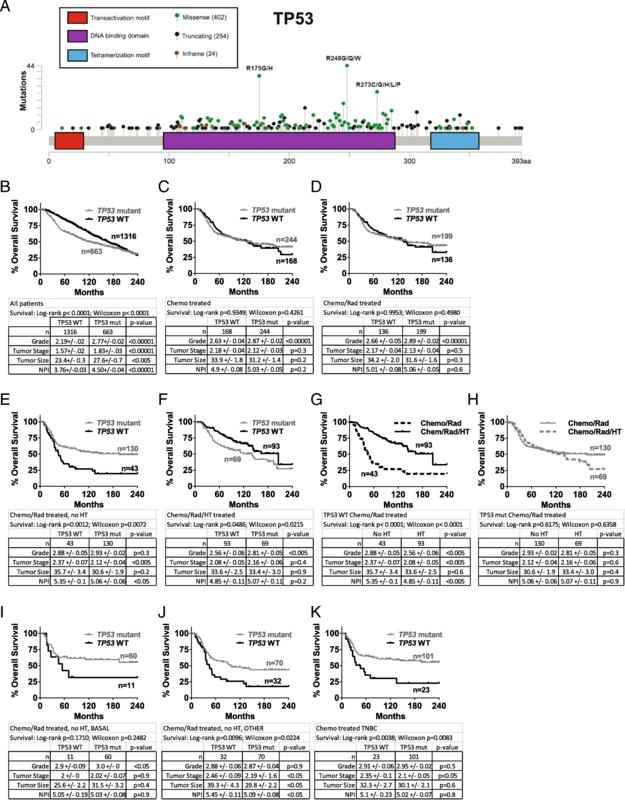 Triple-negative tumors and those of the basal-like PAM50 classification respond favorably to chemotherapy [4, 15] and also have a high rate of TP53 mutation . We tested whether the favorable outcome of patients with TP53 mutant tumors (Fig. 1e) was due to a bias of basal-like subtype in this population. 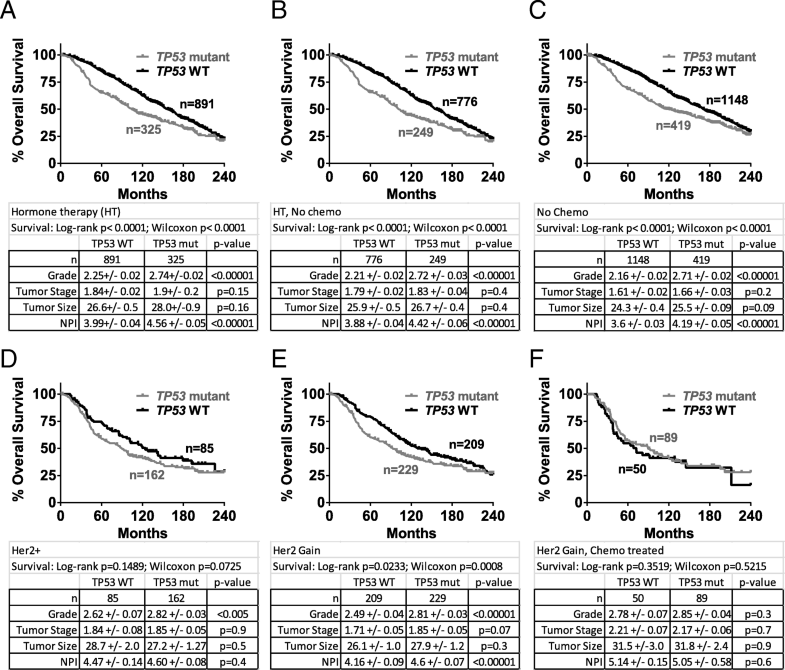 We found that survival curves for patients with TP53WT and mutant tumors in PAM50 subtype “basal-like” (Fig. 1i) were very similar to corresponding survival curves of all non-basal subtypes combined (“OTHER”, Fig. 1j) and all the subtypes combined (Fig. 1e). Triple-negative tumors are often basal-like, and again, TP53 mutant status was highly favorable for patients with triple-negative tumors who received chemotherapy (Fig. 1k, median overall survival 45 months for TP53WT vs 263 months for TP53 mutant [undefined at 240 months]). We next analyzed data from two more specific breast cancer populations: those treated with HT, and those who are HER2+. In all patients who received adjuvant HT, we found that those with TP53 mutant tumors had worse 5-year overall survival in univariate and multivariate analyses (Fig. 2a and Additional file 4: Table S2A), as others have observed . Stratification by PAM50 subtype showed this benefit was mostly in luminal B, normal-like and claudin-low subtypes (Additional file 2: Figure S1G–L). In patients who received HT but not chemotherapy and those who did not receive chemotherapy, two cohorts similar to HT, survival trends were similar (Fig. 2b, c and Additional file 4: Table S2B, C). In patients identified as having HER2 gain or HER2 positivity (any treatment), those with TP53WT tumors had slightly better overall survival (Fig. 2d, e), but this difference disappeared for patients treated with chemotherapy (Fig. 2f). The most profound difference observed in our analysis was superior overall survival of patients with TP53 mutant tumors when treated with chemotherapy plus radiation (Fig. 1e), and the enormous benefit derived from treating TP53WT/ER+ patients with HT following chemotherapy plus radiation observed in univariate (Fig. 1g) and multivariate analyses (Additional file 1: Table S1F). These findings are consistent with studies that show p53 preferentially directs a senescence program instead of cell death in TP53WT breast cancer [9, 16], and suggest the hypothesis that HT improves survival (Fig. 1g) by eradicating these cells. To test this, we treated ER+, TP53WT breast cancer cell lines [17–20] with doxorubicin [9, 21]. MCF-7 and MDA-MB-175 cells were treated with doxorubicin, and 7 days following, addition of tamoxifen resulted in statistically significant loss of viability (at 1 μM and 10 μM, respectively) that was completely rescued by co-treatment with the pan-caspase inhibitor QVD (Fig. 3a, Additional file 5: Table S3). Similarly treated HCC-1428 were insensitive to tamoxifen, and proliferating cell lines were only modestly affected (Fig. 3a). The varying sensitivity of doxorubicin-treated cell lines to tamoxifen is consistent with findings in proliferating cultures . To test if the sensitivity to tamoxifen was dependent on TP53 status, we first performed a CRISPR Cas9-mediated knockout of TP53 in the sensitive MCF-7 cells. Consistent with previous findings [9, 23], doxorubicin treatment of control targeted cells resulted in a senescent phenotype with little death, while ablation of p53 resulted in extensive cell death, and no residual cells present for further study (Fig. 3b). Presence of some protein in the TP53 knockout is consistent with findings that in a fraction of CRISPR targeted TP53 alleles, a stable protein is made . TP53 mutant, ER+ cell lines had some surviving cells present after doxorubicin treatment, but these were insensitive to tamoxifen (Fig. 3c). Interestingly, the notion that senescent, TP53WT cells, but not TP53 mutant, are sensitive to HT was supported by the lack of survival benefit to adding HT to chemotherapy in TP53 mutant tumors that do not undergo senescence (Fig. 1h). Our findings clarify longstanding conflict in the field about the effect of TP53 mutation in breast cancer, as we show clear instances of both benefit and harm based on clinical feature/subtype and treatment. Our data suggest previous discordance between chemotherapy studies showing TP53 mutant tumors respond well initially [4, 6], and survival studies showing TP53 mutation is harmful [3, 5], is likely because survival analyses failed to separate chemotherapy-treated patients who received HT (Fig. 1f) and those who did not (Fig. 1e). The data we show do not prove, but are consistent with, induction of a dormant state such as cellular senescence in the TP53WT tumors following chemotherapy, which has been previously shown in human patients , mouse models , and cell lines [9, 21, 10]. Multiple independent studies have shown senescent, dormant cells drive relapse by producing cytokines that promote proliferation, survival, angiogenesis, and an increase in the cancer stem cell population (reviewed in Rao et al. ). Thus, finding therapies to eliminate senescent cells in tumors is a promising strategy to improve response. Data presented here suggest one mechanism of action of tamoxifen is to kill senescent cells that persist in TP53WT tumors following chemotherapy treatment. Intriguingly, HT did not improve overall survival in patients with ER+, TP53 mutant tumors that fail to undergo senescence after chemotherapy. Chemotherapy-treated patients with TP53 wild-type tumors have poor survival, consistent with models showing p53 induces cell cycle arrest and senescence instead of cell death. Patient survival in this cohort could be improved by strategies to eliminate senescent tumor cells. One potential mechanism by which HT improves survival is by inducing apoptosis in chemotherapy-induced senescent cells. The authors acknowledge Oscar Rueda, PhD and the Caldas Laboratory, of the University of Cambridge for providing details on the METABRIC dataset, Dorota Wyczechowska, PhD, LSUHSC for flow cytometry assistance, and Osama El Demerdash, PhD, Cold Spring Harbor Laboratories, for assistance designing CRISPR guides. All parts of this study were supported by the Department of Defense Breast Cancer Research Program (grant number W81XWH-14-1-0216 to JGJ). The Cellular Immunology and Immune Metabolism Core at the Louisiana Cancer Research Consortium is supported by a grant from the NIN/NIGMS (grant number 1P30GM114732–01). The datasets analyzed during the current study are available at http://www.cbioportal.org/. NAU generated and analyzed data. DY designed analysis parameters and cohorts. SGR, AS, and WDF designed and performed tissue culture experiments. AS and TN performed statistical analyses. JGJ supervised the study and wrote the manuscript. All authors read and approved the final manuscript. As determined by The Tulane University Human Research Protection Office, the activities reported do not meet the definition of Human Subjects Research per the Common Federal Rule (45 CFR 46.102). The data obtained from www.cbioportal.org includes de-identified data, in which the identity of the subjects may not be readily ascertained by the authors, and there is no intervention or interaction with living individuals. The manuscript does not contain any individual person’s data in any form (including individual details, images or videos), and is not a presentation of case report(s).